Celkon Mobiles is all set to launch the 7-inch sim-based tablet Celtab (CT2), priced at Rs 7499, based on Android Ice Cream Sandwich Operating System, a month after it forayed into the segment with e-tab CT1. 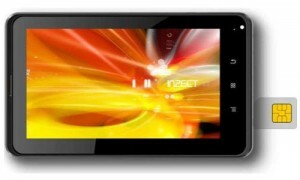 Celtab comes with 1 GHz processor, 512 RAM and a provision for 3G dongle to access the internet, he said. The device has been priced at Rs 7,499. Celkon Executive Director R Murali said the company plans to expand the business abroad and aiming to reach the Rs 1000-crore mark turnover in FY13. best thing for budget people out thr.. Would like to have one of it, if it’s good with hardware..